As a storm system moved in from the west this afternoon, I headed out driving right through it. The drive should be about an hour and a half to Sandusky from where I live. The rain wasn’t too bad and I made it in about 1:45. 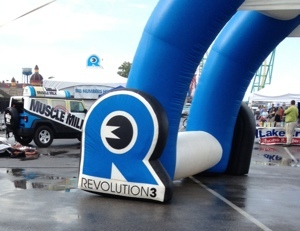 Revolution 3, or Rev3 for short, organizes very family friendly races with Cedar Point in Sandusky being the only race of the series to have a full 140.6 course along with a half iron distance. The other races are Olympic distance and half iron. 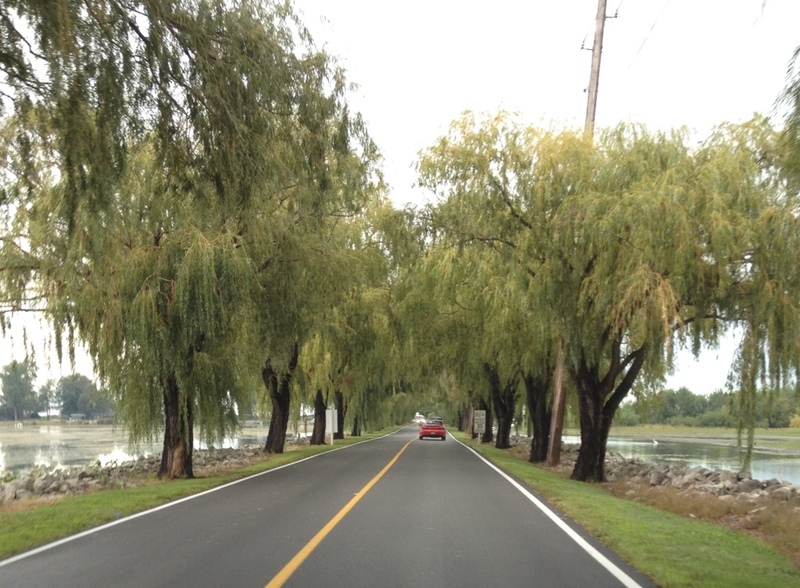 The last eight miles of my drive is along a causeway to the park. For those reading who are not familiar, Cedar Point in Sandusky, Ohio is a very large and highly acclaimed amusement park. With this being the third year in a row to participate in the half iron distance race, memories abound. The bike course starts and finishes along the causeway, so driving in brought excitement and nerves. Here is a view that will be my return ride in. Once I got to the park I went to the expo first to pick up my packet. I was surprised at how long the line was with this being the first day and registration had been open for three hours. The rain must have delayed people, fortunately it had stopped before I arrived. 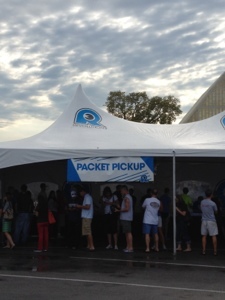 After I picked up my race number and timing chip I headed over to pick up my SWAG bag. (stuff we all get – clever acronym) The best goodies are the visor with the race logo and really nice goggles by Blueseventy. After I had my race items, I wet to the hotel to get situated. I am staying right in the park and the swim start is right infront of my room. 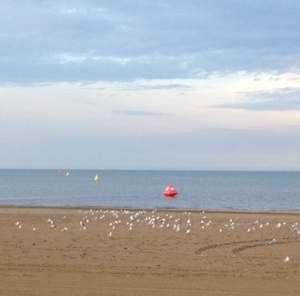 Here is a shot of the buoys from the beach. Today was a rest day and I am glad I was able to fill it with the drive and expo visit. My nerves come and go, having activities helps me remain calm. 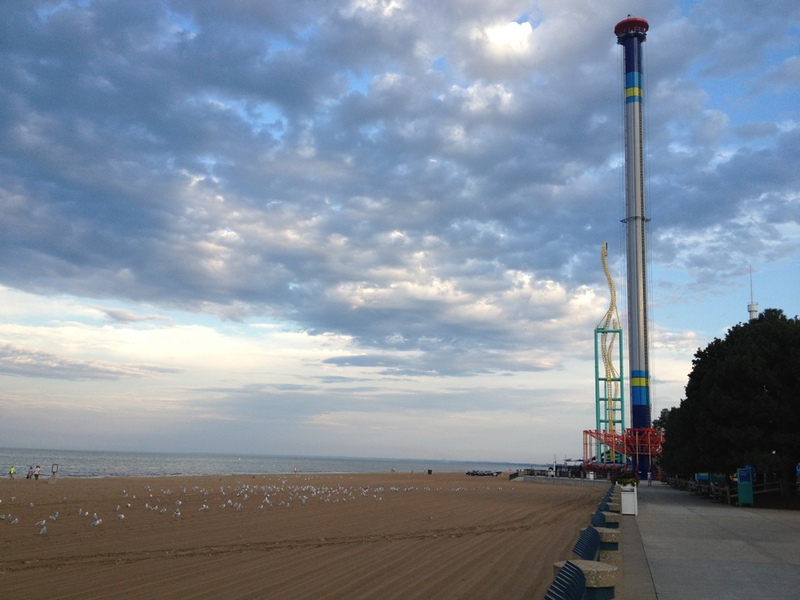 As I headed to dinner I took a picture of Lake Erie with one of the rides to the side. A beautiful view to cap a good day. Thank you so much Nick. I am praying for a safe and fast race. Yeah…you got swag. Have a great race…I’ll be praying for you too!